Remember the song from Avenue Q that chirps that “Everyone’s a little bit racist”? That is the premise as well of Bruce Graham’s unsettling contemporary drama, White Guy on the Bus, now receiving a powerful area premiere at Coral Gables’ GableStage. 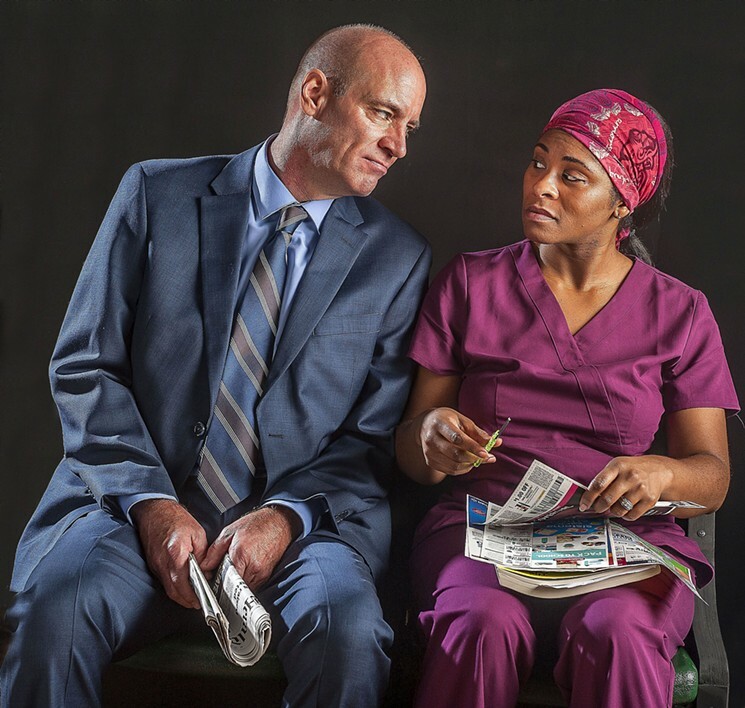 Expertly directed by Michael Leeds, who orchestrates a top-notch cast led by Tom Wahl – the eponymous “white guy” – the play bristles with intelligence as it explores the racial and economic divisions in society. Wahl plays a financial numbers guy named Ray, adept at making “rich people richer,” content living in his suburban white bubble of privilege. But for reasons that will be left for theatergoers to discover, Ray begins taking an inner-city public bus and starts talking with Shatique (Rita Joe), an African-American woman studying to become a nurse. She is clearly dependent on the bus for transportation, while Ray’s presence on it remains puzzling until, in the course of their awkward conversation, he makes her a chilling business proposition. But before he hops that bus, we see Ray at home with his ghetto school teacher wife Roz (Mia Matthews), entertaining a younger couple, Christopher (Ryan Didato) and Molly (Whitney Grace). Long his mentor, Ray encourages Chris to join him in the world of finance, instead of the academic track he is on which will likely lead to little monetary reward. And Roz needles Molly about her comfortable prep school teaching job where she tries to educate unmotivated affluent white kids. Graham, who has been churning out clever, articulate plays for decades, usually about life in his hometown of Philadelphia, has honed in on one of his darkest subjects yet. In the era of Trump, particularly post-Charlottesville, White Guy on the Bus feels ripped from the headlines as well as timeless. In addition to juggling grim drama with a measure of humor, Graham adds to the tale’s effectiveness by giving it an anti-chronological structure. Note how Ray seems to be lying to Shatique about his personal life, until we learn of events that transpired before that exchange. As Ray, Wahl is an easy-to-identify-with white guy, a buttoned-down executive who cares deeply for his wife and conveys a fatherly attitude towards Christopher, who was close to him growing up. But as the evening continues, we begin to see that Ray has a growing anger within him which has, yes, racial overtones. Matthews’ character is a caring educator, but her frustration with getting through to her students is expressed in a darkly comic cynicism. Also impressive is Joe as the bone-weary Shatique, a woman shackled by her lack of education and the color of her skin. But she has undeniable street smarts, which she shoots back at Ray in their bus ride debates. Didato and Grace are fine as the young couple, but their characters are underdeveloped, more talking points than flesh-and-blood figures. Still, White Guy on the Bus is exactly the kind of play that artistic director Joe Adler has built his theater’s reputation upon. It is smart, thought-provoking, likely to trigger heated discussions afterwards and bound to stick with you for a long time to come. WHITE GUY ON THE BUS, GableStage at The Biltmore Hotel, 1200 Anastasia Ave., Coral Gables. Through Sunday, Sept. 9. $52-$57. 305-445-1119.